When I built the website for my Stitchery Stories podcast, I chose a specific podcast-friendly WordPress theme from Appendipity. It was easy to use and configure, and created a simple website for my podcast. The focus of the website was to make it easy to visit the website and press Play to listen to the episodes. I also use a great plugin called Simple Podcast Press. I use it to automatically create a draft blog post for an episode when I publish it in my podcast host Libsyn. This is part of my organised podcast workflow when creating, producing, publishing and promoting a podcast episode. The Appendipity theme worked well with Simple Podcast Press, in fact it had been written specifically to work with the plugin. However, Appendipity did not seem to be maintaing the theme, which was a large concern, especially with the way in which WordPress changes quickly. It is important to keep any WordPress plugins and themes totally up-to-date otherwise you cause a security risk for your site. 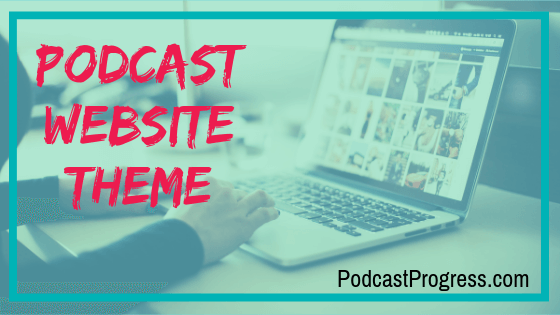 As a reminder, if you have a WordPress site for your podcast website, then please make sure you keep it updated regularly, whether you look after it yourself, or you pay someone to do that. Check what their updates processes and procedures are. I had also noticed that the site was slowing down. I didn’t know the exact cause of that, but a very out of date theme wasn’t going to help! I thought it was therefore definitely time for a new theme for Stitchery Stories. Now of course any WordPress Theme can be used. I just wanted to find a theme aimed at an easy way to showcase podcast episodes. So I searched for WordPress podcasting themes, and Second Line Themes popped up. I chose the Satchmo theme and decided to go for it over the Christmas holidays. Of course I have been using WordPress for many years. I made sure I had the site backed up before I started changing to the new theme. I downloaded the new theme, activated it and then went to see how things looked. Phew! The site still worked – hurrah – but obviously there were several visual things that needed sorting out. One of the big changes for me was that Second Line Themes uses the Elementor WordPress Page Builder. I hadn’t used that before, so I had a bit of a fiddle about, getting used to how that worked. It took me a few hours to get used to the new editing interface, and to work out which settings to change to impact different areas. But that is true for any WordPress Theme. Of course, the WordPress editor, Gutenberg also went live around the same time, so I had 2 new things to work with. And choose which to work with… the old classic editor, the new Gutenberg editor, or the Elementor editor that comes as part of the theme. Choices, choices,choices. Happily enough, they all seem to work alongside each other so it’s not a problem for me to deal with. However, you could find it somewhat frustrating or confusing if you don’t have much WordPress experience, or are not technically confident. I think it speaks well for the robustness of the theme that it copes with these editor combinations. Again, this is an issue that affects any other theme, we now have a choice of page and post editing methods. I like the way my ‘home page’ can feature a grid to showcase the podcast episodes. They make use of the ‘excerpt’ feature too so it provides a nicer browsing experience. I have to go back and set the excerpts for some of the earlier posts, but I have updated the newer posts. It was also nice to add some social media icons next to the upper menu. I have a problem with the feature image on each individual post but am getting around that. I need to set some time aside to sort that out. Annoyingly, the site still has speed issues, but at least I have a shiny new theme installed. There are a lot of images, but they are optimised to reduce their size. Anyway, I have a few things to check and improve. Check out the new podcast website for Stitchery Stories textile art podcast. Why Does Your Podcast Need A Website? Are you are wondering why a podcast would need a website, or what your podcast website options are? I have written a couple of blog posts about it that you might want to read next. And of course, if you are wondering about launching a podcast, and want some straight-talking podcasting advice, then please check out my podcast services to learn about the uniquely structured way in which I help you.